One way to keep schools secure is to make sure that the entrances are well-protected. It doesn’t matter how large your campus is, or the type of school that you administer. Everyone will feel much safer, and a safer environment fosters learning. So here is a look at how to improve school security, especially by the entrances. Everyone will feel much safer, and a safer environment fosters learning. So here is a look at how to improve school security, especially by the entrances. A simple way to increase school security is by using the latest in security camera technology. High definition cameras will produce higher-quality video and audio. You can see what is happening at the front entrance of the school and every other entrance to the grounds as well. Work with the security provider that is associated with your school district or community to see if these cameras are available. Access control systems allow you to boost school security as well. That way, you will know when your employees enter, and everyone who comes into the building is authorized to do so. These systems can work with the cameras integrated into your school’s existing security system. Plus, you can place biometric security and card readers on interior doors to facilitate lockdowns whenever those situations should become necessary. At the start of the school day, keep all of the doors monitored. During this time, teachers, staff members, and school resource officers can be deployed to every available entrance. As such, they can talk to every visitor, even the ones who regularly come to campus, and have them check in at the main office to help uphold the visitor system. 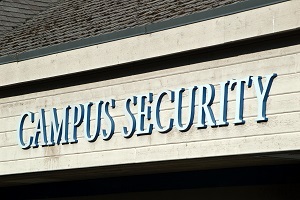 One final way to improve your building’s school security is to have a visitor system in place. Whenever a visitor checks in at the school’s main office, they should receive a visitor badge with their full name on it indicating that they are not a typical part of the school community. Even interns who have come from nearby universities to learn how to teach should be issued with a visitor’s badge. Using software associated with the visitor system can also tell administrators if the parent or visitor will present a threat based on the visitor’s identification. This entry was posted on Thursday, January 17th, 2019 at 9:32 am. Both comments and pings are currently closed.